Hello everyone, this is Isochron presenting Meta Monday. Since there was no ETS tournament this week, we get to talk about the special ECL Saturday tournament hosted by TGP. And as luck would have it, one of the top 4 finishers was a JPS deck. Now, people who know me are perfectly aware that whenever the metagame allows for it, I will play JPS (Some might even be aware of my boisterous claims of being the inventor of non-unitless JPS.). Sadly, most metagames do not let JPS do its thing. However, Makia put up a respectable fourth place finish with an amazing JPS deck. It’s not how I personally would have built the deck, but it’s such a piece of art that I cannot have any serious complaints about it. 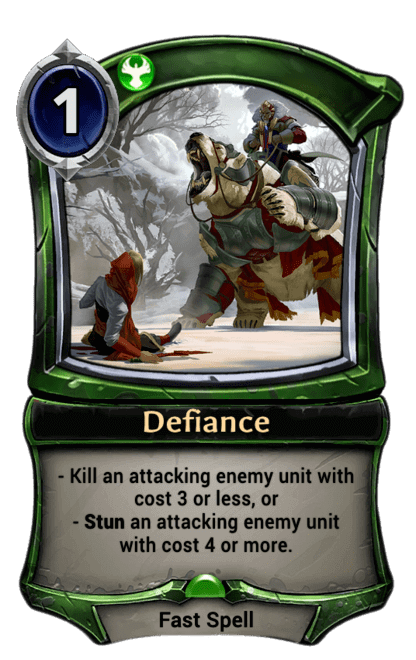 Although the choice to not play any copies of defiance is somewhat questionable, it seemed to work out mostly well. The first important piece to note is that Makia runs the entire core of JPS, which is the combination of full play sets of Slay, Wisdom of the Elders, Harsh Rule, and Black-Sky Harbinger. This is an extremely powerful set of cards that’s near unmatched in sheer versatility. First, Slay and Harsh Rule can deal with almost anything the opponent tries to put out, and even though JPS is somewhat weak to Jotun Feast-Caller and other powerful aegis units, there’s only a limited amount of aegis that can be in a single deck and JPS can very well have more removal than that. The deck also chooses to run Vara, Vengeance Seeker instead of the aforementioned Jotun-Feast Caller. I have experimented with builds that have both of these cards, but practically you have to make a choice. Vara makes Feast-Caller practically useless into a lot of decks, so having both of them in your hand is almost always a highly negative thing. However, the current meta has more aggro than time decks, so Vara should be the right call. The deck runs an even more sophisticated package of finishers than just the two units. 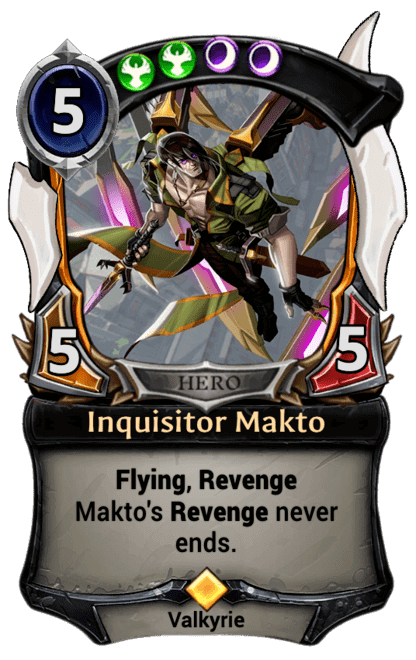 First, it chooses to play Inquisitor Makto. This is usually not the best play when it comes to JPS, but with the prominence of FJS, there’s really no other card that can match up as well. Although not all FJS builds are weak to Makto, being able to have a recursive unit against the builds that have no silence effects in a deck that can reliably shut down Statuary Maiden is a big deal. When you get one or two Maktos to perpetually revenge, the difference in the board advantage starts lessening turn by turn. Makia’s build of FJS also runs two copies of Dizo’s Office. This was one of my favorite cards when we got to look at sites, and it’s definitely the card with my favorite artwork in Eternal. The Eternal player base seems to agree with me as Dizo’s Choice has become a more mainstream choice for cards. The ability to both kill a unit with Cut Ties and use the powerful card selection more than make up for how slow Dizo’s office can be. And finally, the deck runs a singleton Sword of the Sky King. I personally like running two copies so that there’s a higher likelihood of drawing a Sword every game, but when trying to match up against mid-range decks, Sword can often be a liability, which is why only including once copy is a very reasonable choice. The deck’s removal package is also masterfully built. Makia has diagnosed that Rindra’s Choice and Devastating Setback are far better than Annihilate/Vanquish and Hailstorm in the current metagame. Aggro decks don’t tend to rely on many units with health above 2 right now, and the ability to force the opponent to discard means that it will not be a useless card when it comes to the FJS match-up. Furthermore, the presence of FJS also means that Rindra’s Choice is exceptionally powerful due to being able to hit many units in that deck. This is made even more appealing by how many multi faction units decks like Rakano Aggro and Haunted Highway run, among many others. This all means that Rindra’s Choice should be the go to piece of 2 power removal for decks that include Feln influence. And before we get into the market, the deck also runs a play set of Lost Scroll and three copies of Cull the Deck. Lost Scroll helps put out the top end at a reasonable pace while Cull the Deck is the best piece of card selection in the entire game, with only Quarry being debatably better due to its role in reanimator decks. And finally, the market in this deck is fairly great. 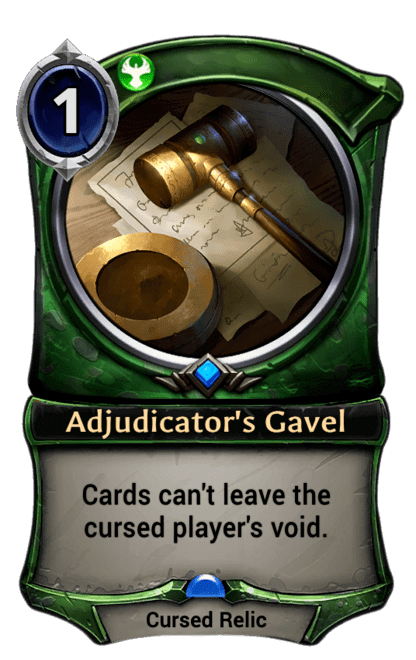 First, the Adjudicator’s Gavel shuts down many reanimator strategies, whether they rely on Vara or Haunting Scream. Then, forgoing any main deck Vanquishes also means that the Hidden Road Smuggler can get Vanquish to defeat Xo or any other unit that it can target. Furthermore, JPS would not really be JPS if it lacked Vision of Austerity, this card is a complete powerhouse against decks that rely on relics, and has been the only way that JPS can even have a match-up against decks that rely heavily on relics. It can also help alleviate extremely desperate situations, like being cursed with Azindel’s Gift. And instead of running Regent’s Tomb in the main deck, this deck has reserved a spot for it in the market. Regent’s Tomb is a perfectly fine card, but sometimes drawing into it too often might be a problem. And while FJS has an assortment of powerful units on curve, mostly due to being able to run eight merchants, JPS has far fewer options to protect the Regent’s Tomb. But when the card is great, it’s really fantastic, and definitely deserves a role in the market. The final inclusion is a single big Vara, which can bring back both Black-Sky Harbinger and small Vara. Or, it can also target Hidden Road Smuggler and allow the player to access the market a second time. This is the best finisher against mid-range decks that JPS can get its hands on, which makes running it more than reasonable. Although a card like Azindel’s Gift would decimate control based match-ups, sometimes value and board presence goes a long way. The third place was taken by Squadhawk, who opted for a fairly standard build of Jennev Mid-range. Although an interesting thing to note is that instead of running any copies of main deck Howling Peak, Squadhawk opted to run two copies of Moonstone Vanguard and two copies of Kaleb’s Choice, both of which are excellent cards. The deck also does not play any Jotun Feast-Callers. On the market side of things, two Ixtun Merchants and one Howling Peak Smuggler make for a wide array of market options. The market itself consists of Bore, if the Kaleb’s Choices are lacking when dealing with relics. Urn of Choking Embers, which chokes out any charge based aggro deck. Hailstorm and Burn them All, which are both good removal options, and a single copy of Howling Peak, for obvious reasons. Lysxx took second place with Haunted Highway and Kroge took first place with FJS. Congratulations to all top 4 finishers. There will be another ECQ this weekend, so keep your eyes peeled for some great Eternal competitive play. This has been Isochron with Meta Monday.